More and more people are drawn to the outdoors to get away from the stresses of everyday life. The right kind of footwear is essential for outdoor adventure seekers. Excellent outdoor footwear will always ensure secure footing, and guarantee a high degree of safety - whatever the terrain. Whether you are touring the mountains, trekking, or hillwalking: You can always rely on your outdoor shoes! What qualities should outdoor footwear have? As an outdoor lover you will be spending a lot of time and long hours on rough terrain, so a quality outdoor shoe has to be tough. That's why outdoor footwear needs to meet some specific requirements. The most important factor is that good outdoor shoes should be comfortable. After all: your feet might be in those shoes or boots all day long, which means superior wear comfort is an absolute must. Outdoor shoes must be comfortable, fit well and offer support without being constricting. This will prevent pressure points, blisters, and chafing. And that means you will remember the beauty and not the pain of your hiking tour! A well-padded footbed will ensure even more wear comfort. Good outdoor shoes must also be robust, since unlike regular everyday shoes they must withstand rough terrain and adverse weather. Your shoes should be able to withstand any kind of stress when walking or hiking in the mountains. In extreme situations, a broken shoe is the last thing you need. Sturdy outdoor footwear will also keep you safe and make sure you can get a secure foothold. Models with a reinforced shaft will additionally protect the ankle and help reduce the risk of injury. Another important consideration when it comes to outdoor shoes is weather protection. Outdoor boots must protect feet from moisture, because wet feet not only feel uncomfortable, they will also freeze very quickly. In extremely low temperatures, moisture can be a real problem because cold feet will restrict blood flow in the mucous membranes. Any virus or bacteria in the air will have a field day! Shoes and boots with a breathable membrane will wick the moisture from perspiration around the foot outward, while at the same time preventing external moisture from saturating the shoe. Your feet will stay dry and warm whatever the weather. What type of outdoor footwear is right for me? These are the most commonly worn outdoor shoes, and are perfect for walking on uneven paths in the mountains and highlands. They are available as high and rigid hiking boots, hiking half shoes and also as very lightweight hiking boots. Walking boots are usually waterproof and often equipped with a Gore-Tex Membrane. Well-known companies like Lowa or Dachstein produce premium walking boots in leather or synthetic which are comfortable and durable and thanks to their grippy soles and well-fitting laces ensure a safe footing and good grip. With comfortable walking socks you will be able to do your best hiking and you will no longer need blister plasters. In contrast to walking shoes, walking boots are designed for long hikes with heavy luggage. That means that these waterproof boots are made to be especially robust. The shaft is usually higher and protects and stabilises the ankle for carrying heavy backpacks. Hiking gaiters are the perfect addition to walking boots, because although leather boots are mostly waterproof they still need a few hours to dry. 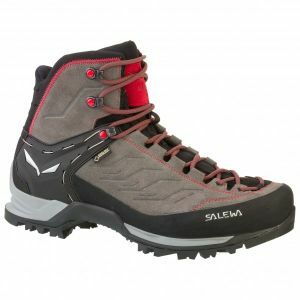 While there are significant differences between mountaineering boots, expedition boots and trekking boots, all of these mountain shoes have relatively rigid soles and crampon compatibility. The special sole construction enables crampons to be easily and securely attached. Thanks to their well protected and reinforced toe boxes, heels and rock guard on the sides, mountaineering boots are extremely robust. You can even master simple climbing routes with their rigid soles. Via ferrata shoes are essentially a sporty and lightweight mix of mountaineering boots, multisport shoes and walking boots. The via ferrata shoe is lightweight and robust and should protect and stabilise the ankles. Their soles don't need to be crampon-compatible, but they should be grippy, robust and good for climbing. Some feature special climbing zones on the toes to ensure a secure foothold on small toeholds on cliff faces, and this increases the versatility of via ferrata shoes. Approach shoes are worn by climbers and boulderers to get over forest, grassland and gravel routes to crags or bouldering blocks. Approaches are often small hikes, which sometimes cover loose gravel and narrow paths. That's why a robust sole with good grip is a necessity for an approach shoe. Shoes for climbing are available in waterproof and mid-cut varieties and most of these make easy scrambles simple to overcome. Climbing shoes and bouldering shoes pick up where approach shoes leave off. Climbing shoes from companies like La Sportiva or Red Chili are ideal for vertical cliff walls and climbing halls, and give you perfect grip even on small toeholds They provide the best footing for every climber. But they are not suitable for running on horizontal surfaces. When it's cold outside and you are pushing through snow and ice, warm shoes like winter hiking boots are the right choice for sporty outdoor adventures. These lined shoes offer the best protection for wet and cold and guarantee warm and dry feet. They are not really suitable for running, but ski boots ensure optimal power transfer for skiing and a high level of comfort. Different models are optimised for use as ski touring shoes or freeride shoes. The right ski socks guarantee you will have the maximum skiing fun. Foot warmers or down shoes are very lightweight and will keep your feet comfortably warm in a bivouac or sleeping bag. 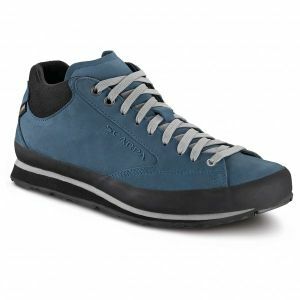 Sneakers, sports shoes and fitness shoes are usually not specialised outdoor shoes. Some models and companies, like Ecco, feature grippy soles and comfortable footbeds, which makes them well suited to light hikes off the beaten path. They are also very versatile and perfect for every day wear. For jogging or trail running - running shoes are lightweight and offer superb performance and robust running behaviour. Trail shoes, natural running shoes and running socks are specialised variations on running shoes. Mountain bikers often wear downhill shoes, robust freeride sneakers or compact MTB shoes. Road bike shoes are almost always clip-in shoes for Shimano SPD, Mavic or other clip-in systems. Cycling overshoes and cycling socks protect against wind and rain during cycling. Hiking and walking sandals, like those from Teva or Crocs, provide superb ventilation during summer hillwalking and also offer a comfortable wear feel and good options for adjusting the fit. Wellington boots and rain shoes are ideal as waterproof shoes for rainy days. 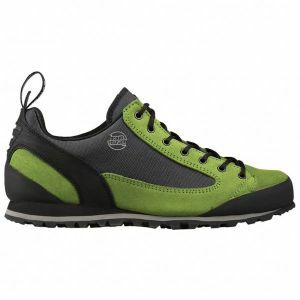 The high shaft makes these waterproof shoes perfect for damp meadows. House slippers and hut slippers are mostly used at the end of a day's hiking, when you want to get comfortable in the hut or at home with a warm and cosy house slipper.